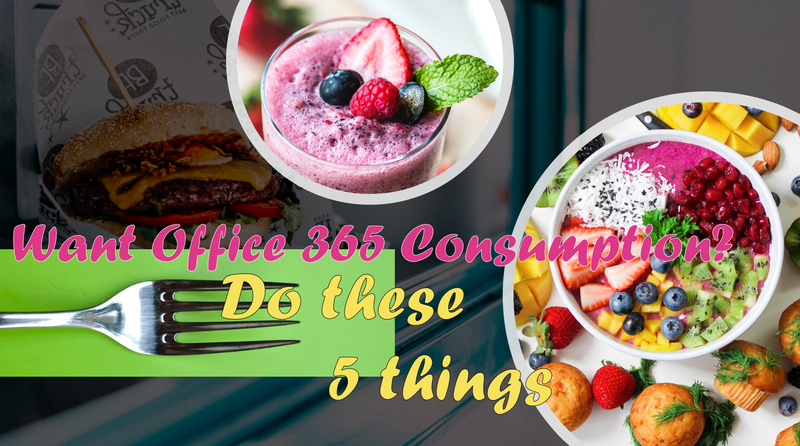 Consumption of Cloud Technologies / #Microsoft #Office365 is something everyone ‘craves’. I suppose that’s the physical measurement of adoption. There’s been many theories and good examples on how to achieve adoption, but sadly many companies fail. I suspect it’s because we’re focusing on the wrong stuff. Here’s some tips on how to achieve that. I understand what the problem is and help customers daily to overcome this. To help you see this from a different perspective I’ll use the analogy of healthy eating habits. Bob is a 37 year old ex-bodybuilder and fitness coach. It’s his job to see new clients (Management and IT Decision Makers) and convince them that smoothies are the way to go. Company X is sold on “reduction of canteen staff” and decides to move across to the smoothie subscription license where each user gets a smoothie maker, meal plan and access to recipes online. Based on information supplied by Bob, this product sells itself as all employees want to live healthier, so change management is minimal. On the day of the switch, Company X sends an all company email out, informing employees of the decision to be healthier, giving instructions of where they can pick up their new branded smoothie maker and include a URL to the online instruction and recipe database should they require assistance. They also add a link to a motivational video by the CEO on healthy living and how much better everyone’s lives will be. A month later management asks for reporting on usage and it’s noted that consumption is much lower than expected. Upon investigation, they find that employees started bringing their own food to work and some are quite negative towards the new system as they don’t see the point / don’t like healthy foods. Surprisingly enough, many wanted to, but never even used their smoothie maker as they didn’t know how to switch it on. They’re shocked with the results, not understanding what went wrong and after consulting with other companies, they bring in a qualified nutritionist to solve the problem. I’m sure by now you’re seeing my point? Personally I love healthy foods. I make smoothies daily with fruits, kale, celery, ginger, turmeric and cayenne pepper. I’m an early adopter. I’ve learnt to love the taste and I know it makes me feel much better than unhealthier food choices. That’s also why people with an IT background tend to adopt systems much faster. There’s not much convincing needed there. But, to understand where we’re going, we need empathy for where we’ve come from. Employees have eaten unhealthy foods all their life. It’s all they know, it’s easy and they understand the system of getting lunch with their staff card. So how do we do this different? Also use emails, pamphlets, videos, auditorium sessions etc. Host ‘Show & Tell’ auditorium sessions where someone presents on how easy it is to build a Flow, Form, Sway etc. ROI on Training, transform your business! Feedback and Requests – JUST DO IT!! How do I give feedback on Microsoft Office? Added after publication: Thank you Simon Leyland for reminding me to add the prerequisites for user adoption. Project objective to be communicated before engagement with stakeholders commence. Project team which consist of proper representation of the various business units / pillars / departments. There you go, a Change Management Plan for free. It also follows the ADKAR methodology. Easier than you thought, but also more work than you ever could have imagined. But I promise you, if you do this right, you will change the way people work and at the same time change the company culture where employees are happier and with time become self and lifelong learners. 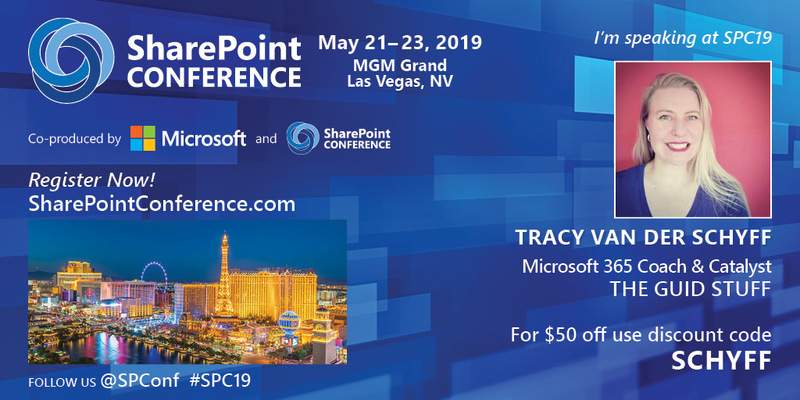 Honored to be speaking at SharePoint Conference in Vegas, May 21-23, 2019. Follow @SPConf & #SPC19 on Twitter for more updates, and click here to register: REMEMBER to use my discount code (SCHYFF) for $50 off! See you there! Every couple of months I’m going to travel to a new country, rent a motorcycle, and travel to as many communities as possible, for 15.2 days. 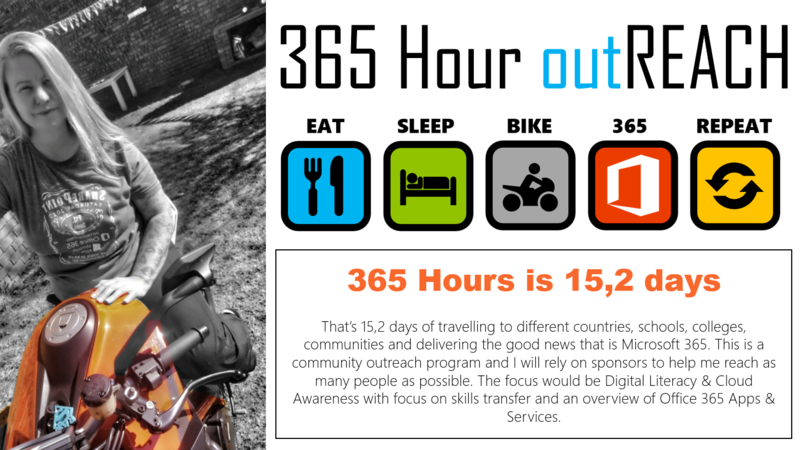 Purpose would be to create awareness around Digital Literacy and give users an overview of Office 365 Apps and Services and how it can transform their lives. I’ll do video and written blogs to capture and share my journey and experiences. Feedback would be crucial, and I’ll be using Microsoft Forms & Flow to gather valuable feedback for myself and Microsoft. I will be inviting other community members to join me on my journey when I’m in their respective areas.